Arianne Bellizaire, who shares interior design tips and tricks on her popular blog inspiredtostyle.com, seized the opportunity to focus on her own home renovation while sharing details with her followers. 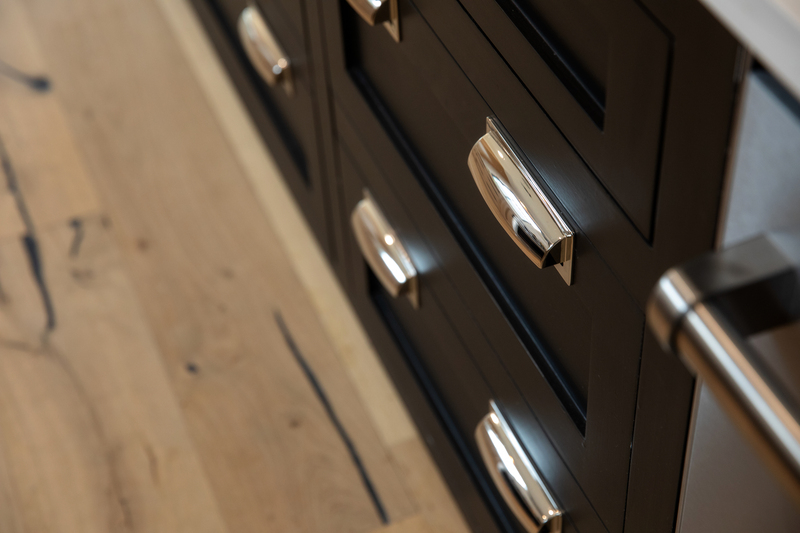 The first major room to be completed, this kitchen, is a model of modern minimalism with plenty of polish. Photos by Collin Richie. Gilded cathedrals in Spain. Ornate Austrian museums. The palaces of London. Arianne Bellizaire’s adventures as an interior design blogger and design firm owner have taken her to some of the grandest buildings in Europe. But when it was time to design the kitchen in her own home, she drew inspiration from some of the smallest spaces on the Continent: the tiny flats and cozy cottages that average Europeans call home. An expanded and multi-purpose pantry took the place of the home’s original powder room. This spot, which houses the microwave as well as refrigerator and freezer drawers, can be used for food prep during parties so that the kitchen island can serve as a buffet station. 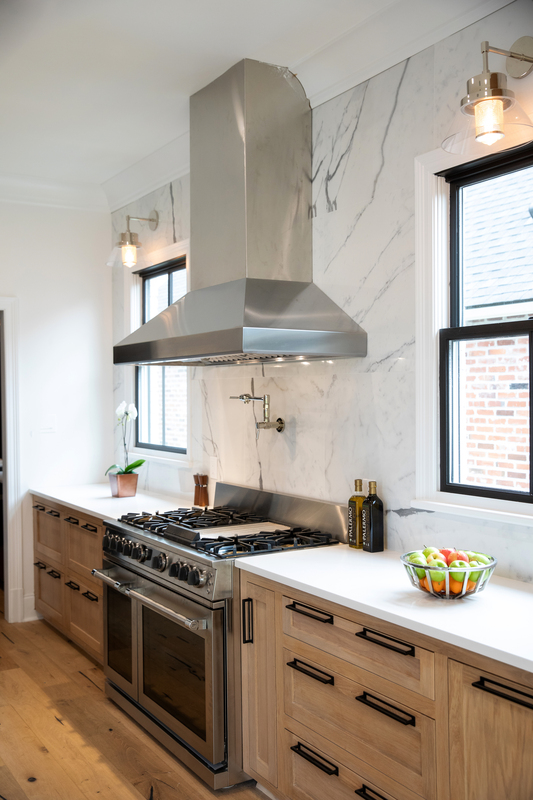 Bellizaire created balance and symmetry in the renovated kitchen by removing a solitary support column and adding a second window on the far wall. 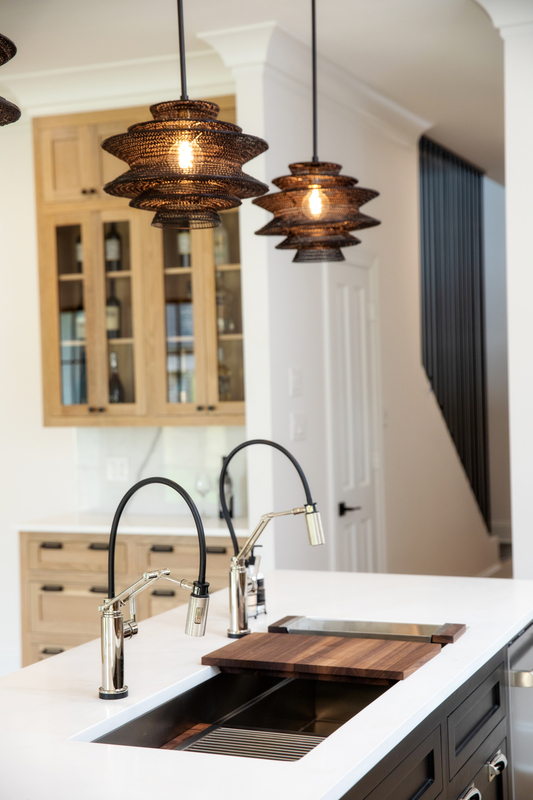 Key design details include fluted panels on the island and angular bronze-mesh pendant lights. 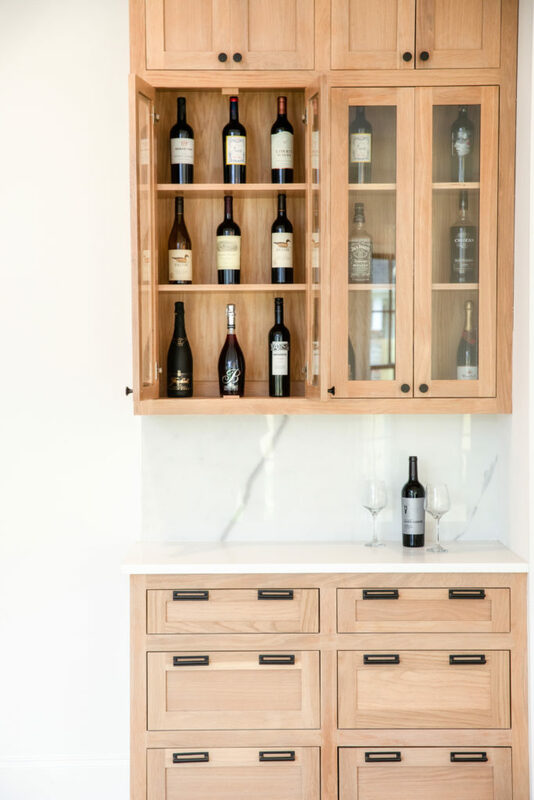 Though Bellizaire had the luxury of working with plenty of square footage in her kitchen, she embraced that pared-down philosophy as a road to restfulness. The kitchen was the first room to be completed during the extensive renovation of her family’s new home: an existing and previously typical south-Louisiana-style structure in the Country Club of Louisiana. Bellizaire and her husband, Reggie, weren’t afraid to buck expectations when it came to refining this abode. Bellizaire’s first order of business during demolition was to remove a massive wooden beam that served as a column at one end of an L-shaped island in the kitchen. But the beam turned out to be load-bearing, which—as any fan of cable TV’s home-flipping shows knows—meant more money and more labor. A detached area of white oak cabinetry serves as a dry bar with plenty of storage for wine bottles and other entertaining essentials. Bellizaire had the column replaced by hidden laminate beams in the attic, which serve the same support function while being out of view. 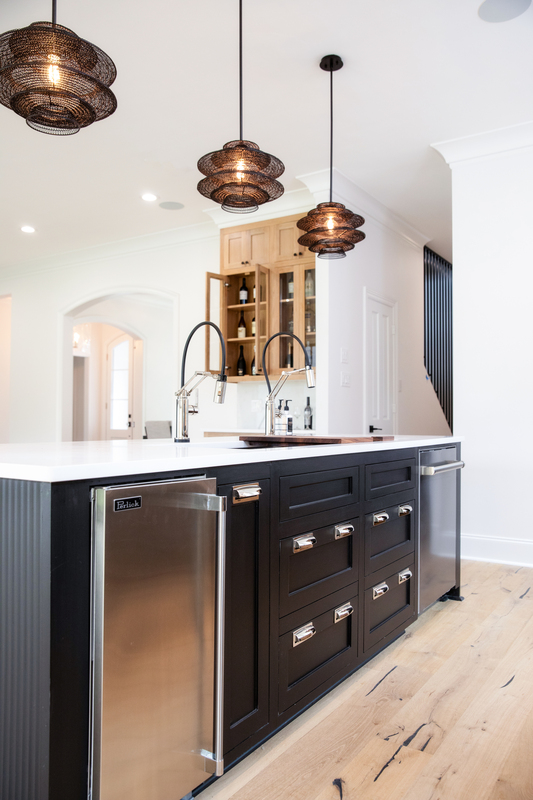 She also started from scratch with a new island that eliminated the usual overhang for barstools and incorporated bold black fluted millwork that contrasts with white oak lower cabinetry along the perimeter wall. 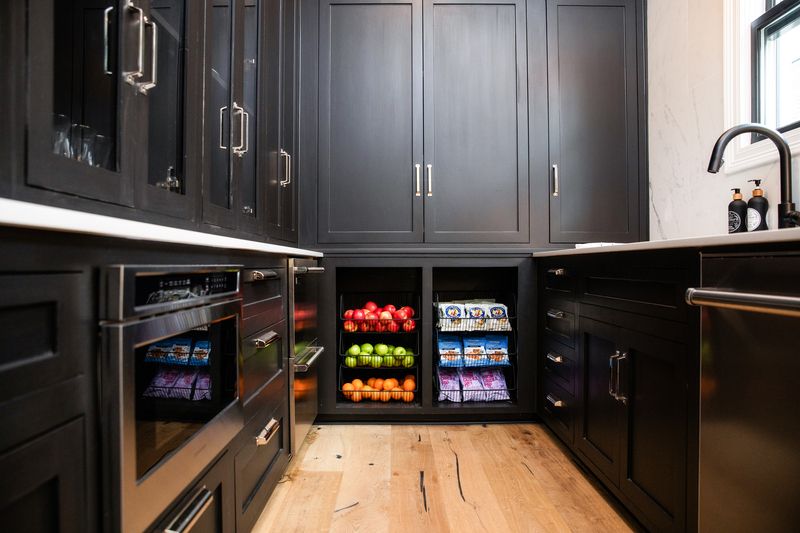 Even though the redesigned open kitchen features no upper cabinets, there’s plenty of storage, thanks to clever organizational elements in an adjacent deep pantry. Here, Bellizaire’s two children can grab their own snacks and beverages from lower racks and a small fridge. A second dishwasher and sink make it easy to clean up mealtime and party-hosting messes.